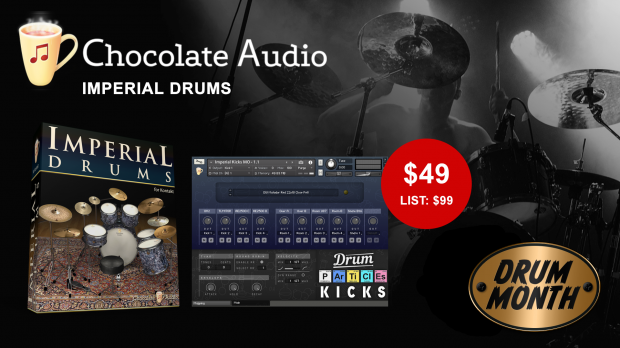 Chocolate Audio’s Imperial Drums were smiled with the very best recording equipment available so you can have an incredible drum sound. During Drum Month Imperial Drums is on promo at 50% off. The medium-sized recording room used on BFD Imperial Drums allows naturally warm ambience and direct mic signals with superb isolation. Many of the included instruments provide alternative ambient and direct mic sets for increased variety. Finally, 13 stick and beater types including hot-rods, webs, rutes and jazz brushes were used to play the instruments. The included drums, cymbals and hihats are expertly set up and tuned by experienced session drummer Elio Rivagli. With over 150 loadable instruments in total, Imperial Drums’ sounds are suitable for all genres of music that demand powerful, musical-sounding drums. This entry was posted in DontCrack, Promotions, Virtual Instruments and tagged Chocolate Audio, Imperial Drums, sampled drums, virtual drums. Bookmark the permalink.